A black and white negative of Roberta Anderson sitting on a couch and smilling. She is wearing a dress and shoes and is leaning back against the armrest. There is a pillow behind her head. 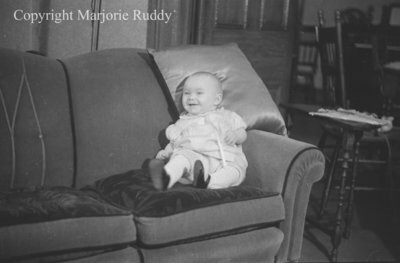 Roberta Anderson, April 22, 1938, Marjorie Ruddy. Whitby Archives, A2013_040_872C.